Lars Vogt continues his cycle of Beethoven’s Piano Concertos with the Royal Northern Sinfonia with this second volume in the series. 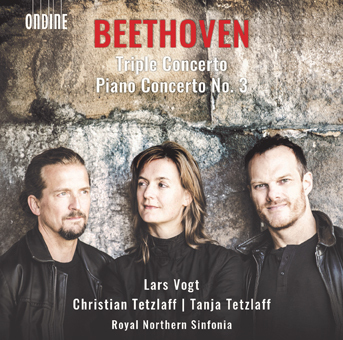 The recording also includes Beethoven’s Triple Concerto where Lars Vogt is joined together with his longtime artistic partners Christian Tetzlaff and Tanja Tetzlaff. • Vogt’s recordings of chamber music with the trio have gathered astonishing reviews and recording awards, including Grammy nomination for the recording of Brahms Piano Trios (ODE 1271-2D). Beethoven’s Triple Concerto for Piano, Violin, and Cello in C major, Op. 56 is a work radiant with joy, described by many as a concerto for piano trio and orchestra. The work, completed in 1803, has standed unrivaled in its genre. Beethoven’s Piano Concerto No. 3 in C minor, Op. 37 is a slightly earlier work and it was premiered together with his Symphony No. 2 in a concert in 1804. It has been noted that the theme in the first movement of the concerto is possibly a quotation from Mozart’s Piano Concerto No. 24 written in the same key, and the both works do ressemble each other in formal, rhythmic, and thematic aspects. C minor key is also a key in which Beethoven wrote many of his most important works, including the 5th Symphony, the Pathétique Sonata and Piano Sonata, Op. 111. Lars Vogt was appointed the first ever “Pianist in Residence” by the Berlin Philharmonic in 2003/04 and enjoys a high profile as a soloist and chamber musician. His debut solo recording on Ondine with Bach’s Goldberg Variations (ODE 1273-2) was released in August 2015 and has been a major critical success. The album’s tracks have also been streamed online over 6 million times. Lars Vogt started his tenure as Music Director of the Royal Northern Sinfonia in September 2015. In June 2017 Lars Vogt was nominated for the Artist of the Year 2017 Award by the Gramophone magazine.